Pork chops and applesauce are a classic comfort-food combination. This is the time of year for it too, which good apples available and the chill in the air calling for deep, savory flavors. This dish is adapted from two recipes. For cooking the chops, I’ve long relied on The Washington Post’s 1+1+4+4 recipe, which was published in 2003. It calls for thick boneless chops to be seared in a hot pan for 1 minute on each side, then covered and cooked low heat for 4 minute each side. Note that this recipe was written before the USDA lowered the safe cooking temperature of pork, so if you want something a little less done, perhaps try 1+1+3+4 or 1+1+3+3. For the glaze, I turned to a recipe from the Eggs on Sunday blog. I wanted a glaze with maple and peppercorn, plus some vinegar to cut the sweetness. This produces a quick pan glaze with a nice rounded flavor. Served alongside some simply dressed greens and homemade applesauce, this makes a great weeknight dinner. 1. Heat canola oil in a medium frying pan over medium-high heat. Pat chops dry with paper towel and sprinkle with seasoned salt. Fry in pan for 1 minute, turn over and fry another 1 minute. Turn chops, lower heat to low, cover pan and cook for 4 minutes. Turn chops and cook another 4 minutes (this is for well done, reduce cooking time to 8 or 9 minutes total for medium chops). Set chops aside, leaving drippings and fond in pan. 2. Increase heat under pan to medium. Add onion and thyme and sauté until softened, about 5 minutes. Add vinegar to deglaze pan, scraping pan with a spatula. Cook about a minute and then add the syrup and pepper. Continue cooking until the mixture has reduced by about half and thickened. Remove from heat and serve spooned over the cooked chops. My mom sometimes says she’s not a good cook, but she’s wrong. She was the first person I learned cooking from and her influence remains in many of my dishes. One of the most important things she taught me was the love for homemade foods. When I was a child, we never ate spaghetti from a can, macaroni from a box or applesauce from a jar. Of those three things, applesauce is by far the easiest. Homemade applesauce is vastly superior to the supermarket puree, which generally contains no spices. When you make it yourself, you can use any apple and enhance its flavor with spices like cinnamon, nutmeg and clove and a touch of lemon juice. 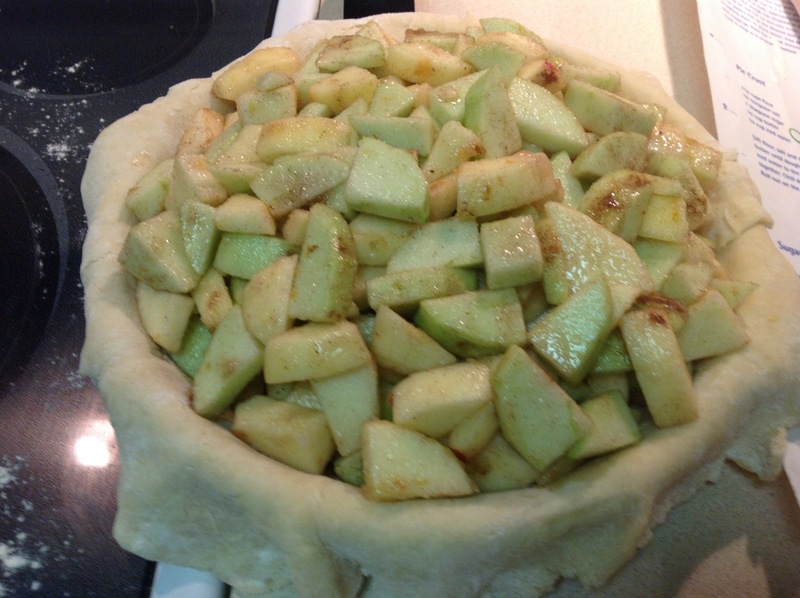 I like to start with pretty tart apples, usually Granny Smith for applesauce and leave it pretty chunky. 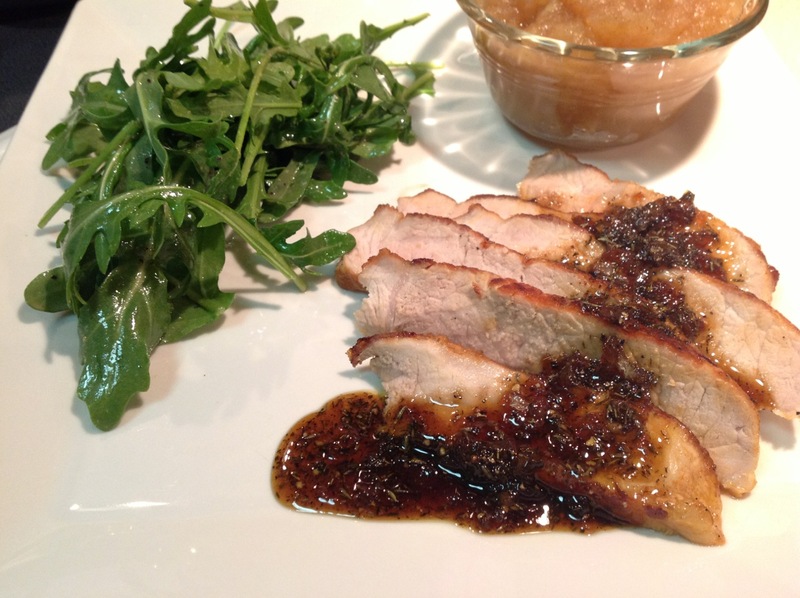 It’s the perfect accompaniment to pork chops and also goes great over vanilla ice cream. 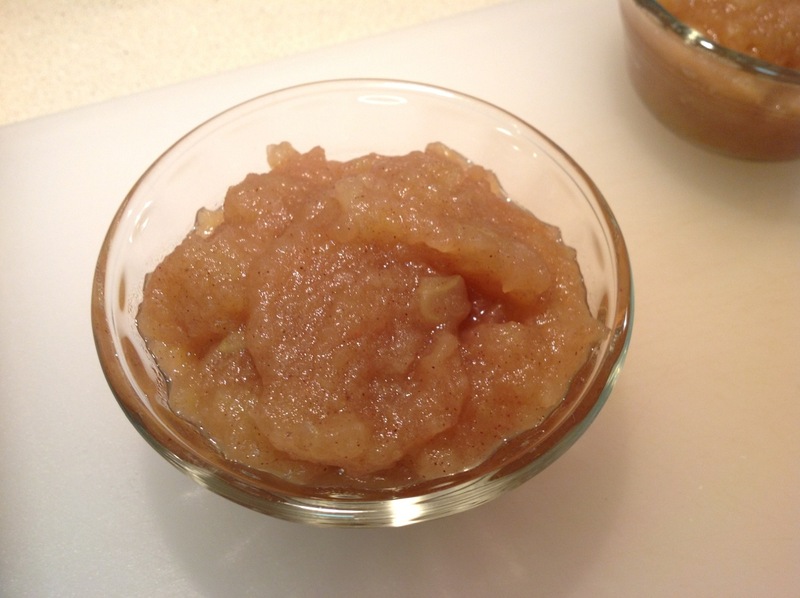 Combine apples, water, sugar, cinnamon, nutmeg and clove in a medium saucepan over medium heat. 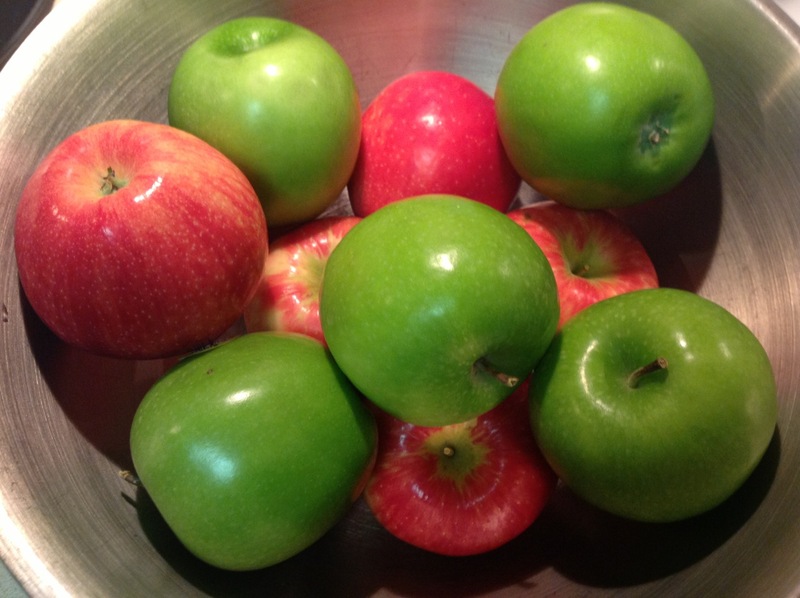 Bring to boil, cover, reduce heat and simmer until apples are very soft and falling apart, about 15 minutes. Stir in lemon juice. I may still be reeling from the loss of my favorite home-delivery pizza, but I may have found a new favorite for-lunch pizza: Wiseguy NY, which opened recently. On my first trip, I ordered a slice of the Margherita, the simple classic of tomato sauce, fresh basil and mozzarella. If every other pizza they offer is as good as this, I'll be quickly hooked. The flavors are all spot on and harmonize perfectly: the sharp fresh basil, the warm embrace of the tomato, the soft mozzarella, all on a thin crust that's as pleasingly limp in the middle as it is crisp at the edge. The garlic knobs are good too--tasting as they should of garlic and olive oil with their fluffy bread browned to a delicious oily crunch at the edge. Wiseguy was closed today (and tomorrow) to expand its kitchen to meet the unexpected demand for their food. I'm not surprised. 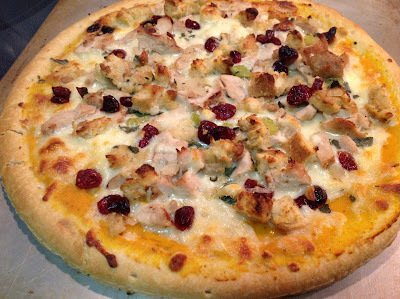 The closest similar outlet, Fuel Pizza, is fine but underwhelming. This is better. Wiseguy NY Pizza. 300 Massachusetts Avenue NW (at 4th Street), Washington, D.C. (Mount Vernon Triangle/Chinatown). Canola oil is the third most widely consumed vegetable oil in the world, but wasn’t widely commercially available until the ‘90s, following the development of genetic modifications that made it suitable for human consumption. 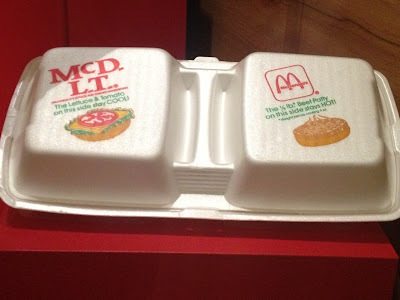 That’s just one of the fun facts I learned at the Smithsonian National Museum of American History’s new exhibit Food: Transforming the American Table 1950-2000, which opened last week and runs indefinitely. T.V. dinners (left) and microwave technology (right) made home cooking faster and more convenient but not necessarily tastier or more nutritious. Although smaller than last year’s National Archives exhibit “What’s Cooking, Uncle Sam?,” I liked this exhibit better because of its broader scope and focus on the influences that have led to the evolution of American eating habits, which continue to change as new trends inform taste and our thinking about nutrition. The divided McDLT packaging may have kept the “hot side hot,” but its polystyrene material wasn’t so hot for the environment. 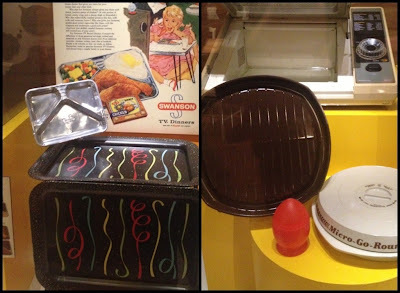 The exhibit begins with the post-war era, a time when industrialization, suburbanization and scientific innovations led to great changes in how and what Americans ate, notably the introduction of convenience foods (think T.V. dinners and snacks like Fritos) and new technologies like the microwave oven. 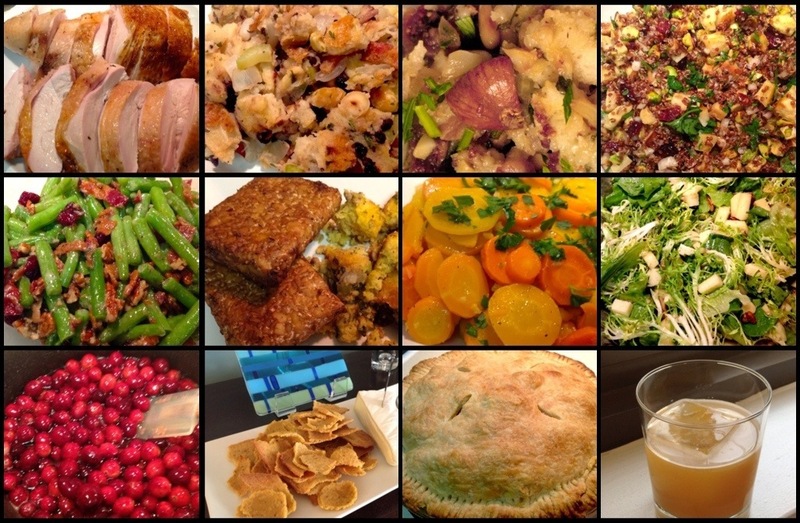 Food was plentiful, increasingly easy to make and affordable. Whether it was delicious was another story. 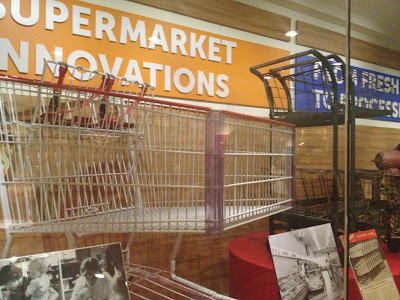 Large grocery stores were an important innovation at that time, allowing consumers to get all their food from one place. Along with those stores came the “telescoping” grocery shopping cart, the kind of carts we know today that stack together in a row, usually lined up by the doors as you enter. It’s amazing how small the original carts where, which the exhibit juxtaposes against the much larger modern warehouse-style cart. A prominent section on the American wine industry reminds visitors that until the late ‘70s, American wines were not held in as high regard as those from Europe. 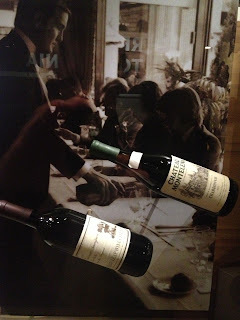 The famous 1976 “Judgment of Paris” wine competition, in which American Stag’s Leap Wine Cellars' Cabernet Sauvignon and Chateau Montelena's Chardonnay beat their European competitors was a turning point for the global prominence of American wine (a story nicely told in the 2008 film Bottle Shock). Although in 1950 fewer than half the states had wine operations, today wine is grown in every state. Other notable sections of the exhibit include displays on ‘60s counterculture’s contribution to food, Alice Waters and Chez Panisse’s influence on organic and local movements and the growing contribution of ethnic foods, with Mexican getting a nice display that include tortilla makers and a margarita machine. A table in the middle of the exhibit allows visitors to rest a bit while perusing various historic nutrition models like the “food pyramid,” along side some examples of similar schemes from other countries. 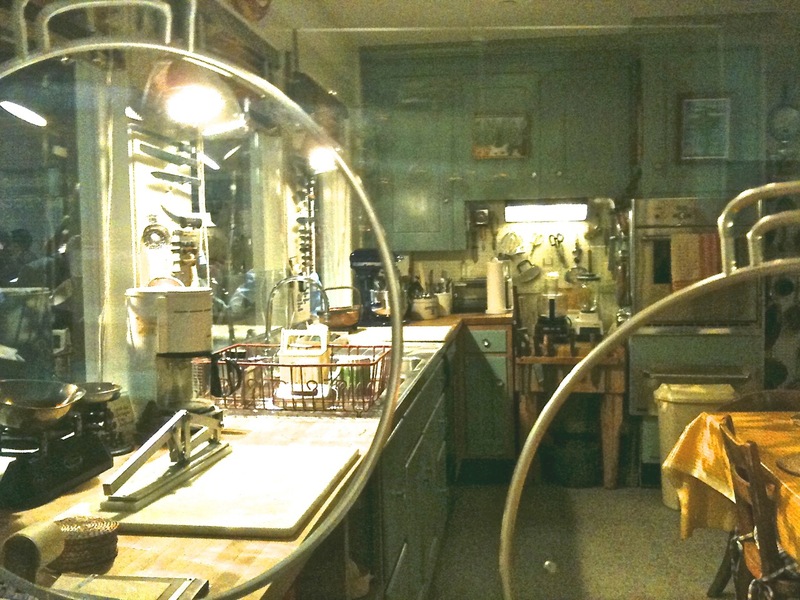 Julia Child donated the complete contents of her home kitchen to the Smithsonian in 2001. Julia Child’s kitchen stands at the entrance and exit to the exhibit, which is the perfect metaphor for American cooking from 1950 to 2000, since she’s been influential almost that entire time from the publication of Mastering the Art of French Cooking in 1961 up through her death a few years ago and the film Julie & Julia. 1) “Opting Out with Carbonara,” by Ian Fisher. At its heart, pasta carbonara is spaghetti with bacon, egg yolk, cheese and pepper. It’s simple, rich, delicious and, as Fisher found, a pasta with an interesting past: an Italian dish with American influence subject to much debate over exactly where it came from. It’s also one with a lot of variation, including some controversy over whether it should include cream (reminds me of the debate over beans in chili). I recently tried my hand at a lighter version of this dish with corn, which must surely anger the purists. The article included a simple Spaghetti Carbonara recipe and a more complicated Spaghetti Friuliano from Locanda Verde. 2) “A Dish for Pilgrim or Maharajah,” City Kitchen by David Tanis. The Times’ story on what to do with Thanksgiving leftovers is rather original: make Turkey Biryani, a take on the traditional Indian rice dish with a fried garnish of cashews and raisins. Really, the only leftover ingredient is turkey (and the turkey stock if you have the bones to make it). Otherwise, this requires a lot of additional ingredients, but it sounds tasty. 3) “Going All In On Thanksgiving,” by Jeff Gordinier. I find I have my work cut out for me making Thanksgiving dinner for six. Linda Horgan of Long Island is hosting 39 this year. Gordinier’s feature explores how she does it. Obviously she’s very well organized. 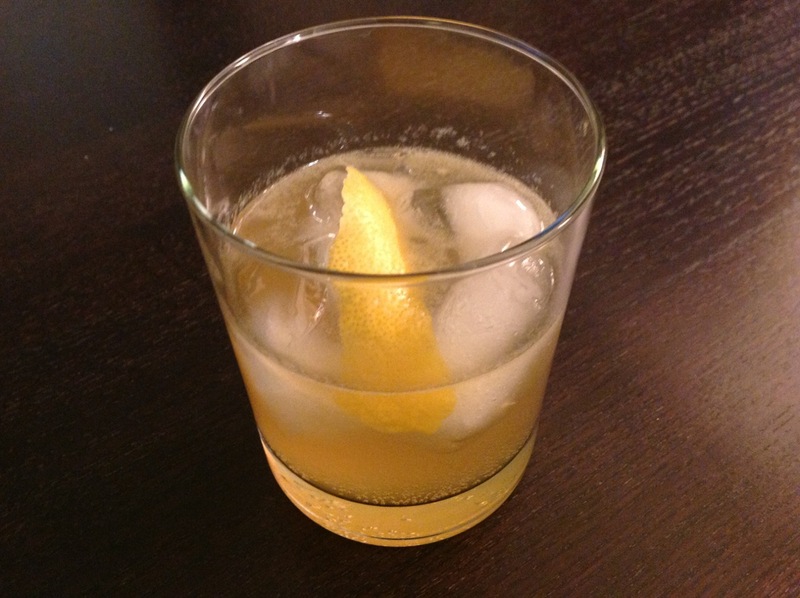 4) “There’s One Thing You Left Out,” The Pour by Eric Asimov. The Times had an extensive Thanksgiving wine column last week. This week, Asimov returns for a second helping, this time focusing on how to find a good pairing at the last minute. His recommendations include Beaujolais, Macon-Villages, Zinfandel and Riesling. 5) “Breakfast Muffins to Replace the Turkey Hash,” A Good Appetite by Melissa Clark. Butternut-Squash Oat Muffins with Candied Ginger, when served alongside yogurt and fruit are what Clark describes as “breakfast along the lines of what might be served at a fancy bed-and-breakfast, the one where maybe you wish your guests were staying.” Man, I’m glad I don’t host overnight guests for Thanksgiving. If I did all that work for the holiday meal--and then had to entertain and cook for several more days--I think I’d lose it. “Father-son mojo,” The Immigrant’s Table by Tim Carman. Now this sounds like a household that really knows how to celebrate Thanksgiving. Bayou Bakery Chef David Guas and his Cuba-born father Mariano Guas have a long family tradition of cooking a traditional Thanksgiving meal on the day itself and, a few days later, preparing a feast of Cuban dishes to celebrate that heritage. Carman’s story weaves Guas family history with a selection of mouth-watering recipes, including a garlic-stuffed Cuban Roast Pork and Fried Sweet Plantains. 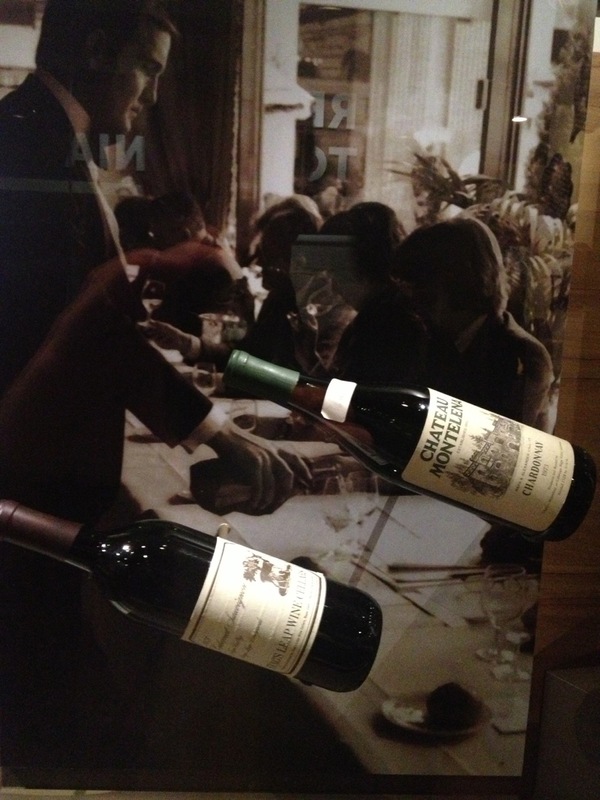 “Wine exhibit pairs nicely with Smithsonian’s food display,” Wine by Dave McIntyre. 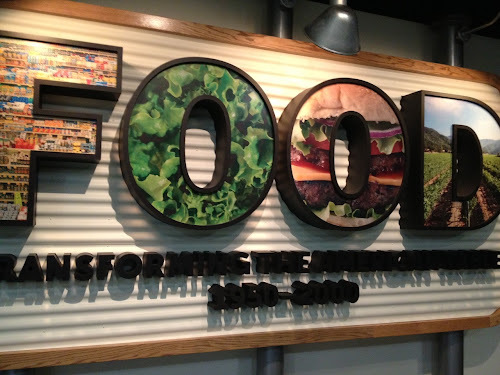 Local food enthusiasts are no doubt excited by next week’s opening of the Smithsonian American History Museum’s exhibit “Food: Transforming America's Table, 1950-2000.” I attended a preview of the exhibit a few weeks ago, and it’s definitely going to be interesting. McIntyre gives a flavor of the exhibit’s wine displays, along with some additional Thanksgiving wine recommendations. “After dinner, splurge with one more indulgence,” Spirits by Jason Wilson. Wilson makes a strong case for splurging on an unusual spirit this holiday season, with suggestions such as Green Chartreuse, Anejo Tequila and Calvados. He also describes the splurgy-worthy $150 Stinger he drank recently at the Experimental Cocktail Club, made with green Imperium crème de menthe. “Broken Spaghetti with Shredded Brussels Sprouts and Onions,” Nourish recipe by Stephanie Witt Sedgwick. Pairing Brussels Sprouts with pasta is an interesting idea, and I can certainly get on board with the caramelized onion. If I make this, and I just might, a little bacon would make it even better. “Don’t just reheat your surplus, rethink it,” by Terri Pischoff Wuerthner. 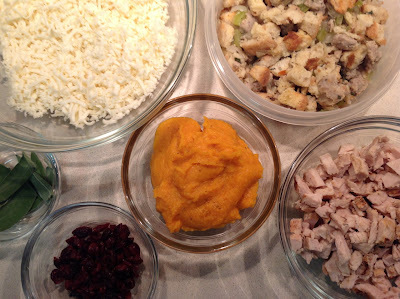 Wuerthner rightly points out that Thanksgiving leftovers can lose their luster after a couple days, and offers up ways to repurpose them into new dishes. With some additional ingredients, turkey and stuffing turn into Savory Turkey and Mushroom Bread Pudding, and mashed sweet potatoes and chicken stock transform into Creamy Sweet Potato Soup with Crispy Leeks. The New York Times. Tough to call this one, as both sections had good stories but neither really stood out for me this week. Since the carbonara story was my single favorite of the group, I'm giving the win to the Times. Roasted Brined Turkey Breast - A wet brine seasoned with herbs and spices gives white turkey meat amazing flavor with this recipe adapted from Bon Appetit magazine. Italian Stuffing - An Italian spin on the traditional dish featuring pancetta, fennel and pine nuts. Roasted Parsnip and Quinoa Salad with Pistachios, Dried Cranberries and Lemon-Shallot Vinaigrette - I'm particularly excited about this original recipe, which brings the popular grain to the Thanksgiving table paired with an under-appreciated root vegetable. 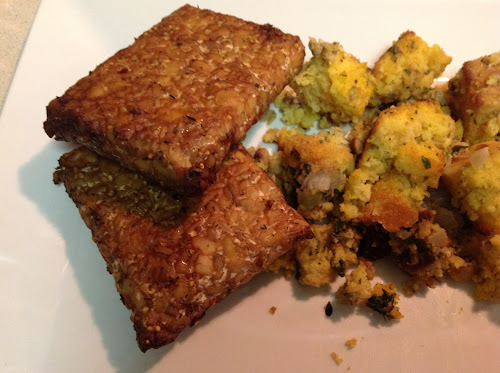 Broiled Marinated Tempeh - A simple, Asian-inspired vegetarian entree. Honey-Ginger Glazed Carrots - Multi-color carrots get a flavor boost from honey and ginger. Apple, Manchego and Pecan Salad - This simple green salad adds a light pit stop to the often heavy fare of Thanksgiving. Cranberry Sauce - After you've tried this simple recipe, you'll never reach for the can again. 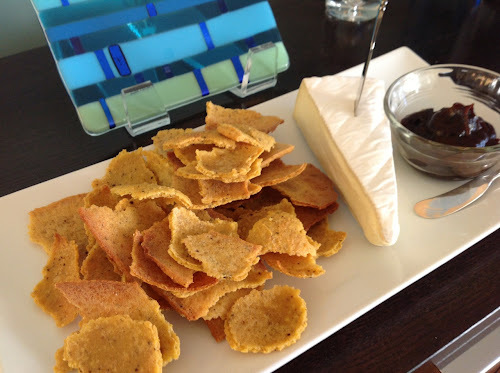 Corn Crackers with Brie and Apple Butter - Freeze-dried corn gives this appetizer intense corn flavor that pairs well with a variety of potential spreads. 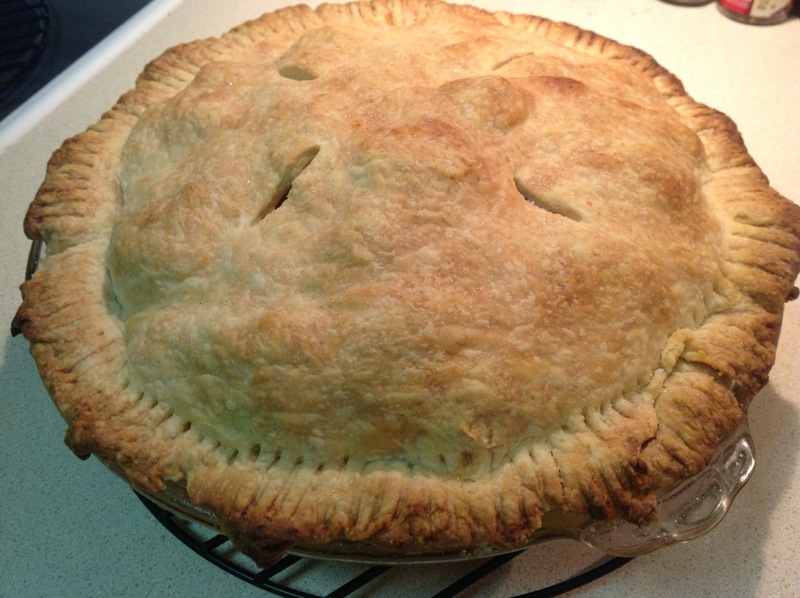 Apple Pie with Vodka Crust - The ingenious cooks at America's Test Kitchen perfect the pie crust with this recipe. Hot Butternut Rum - Kick off the meal with this fiery and playful rum drink made with Todd Thrasher's recipe for butternut squash base. 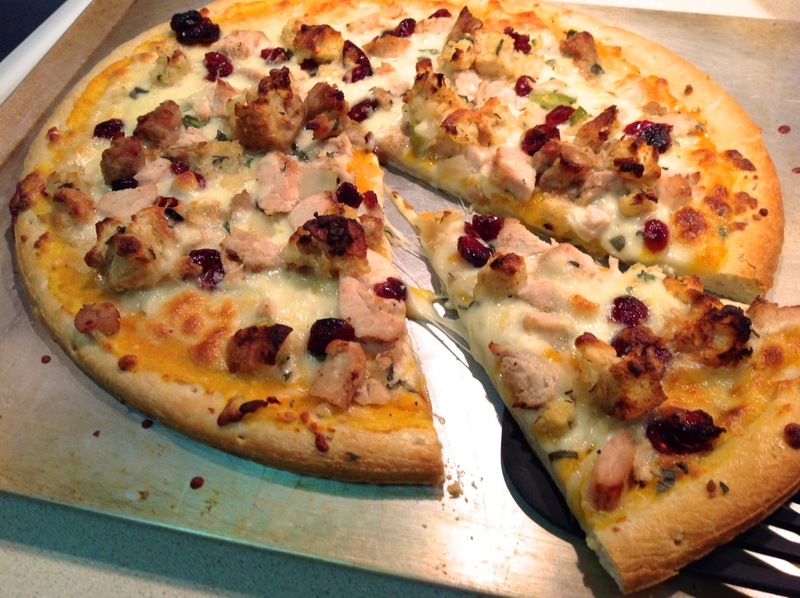 Thanksgiving Leftovers Pizza - Give leftover turkey, stuffing and squash new life by using them as toppings on pizza. 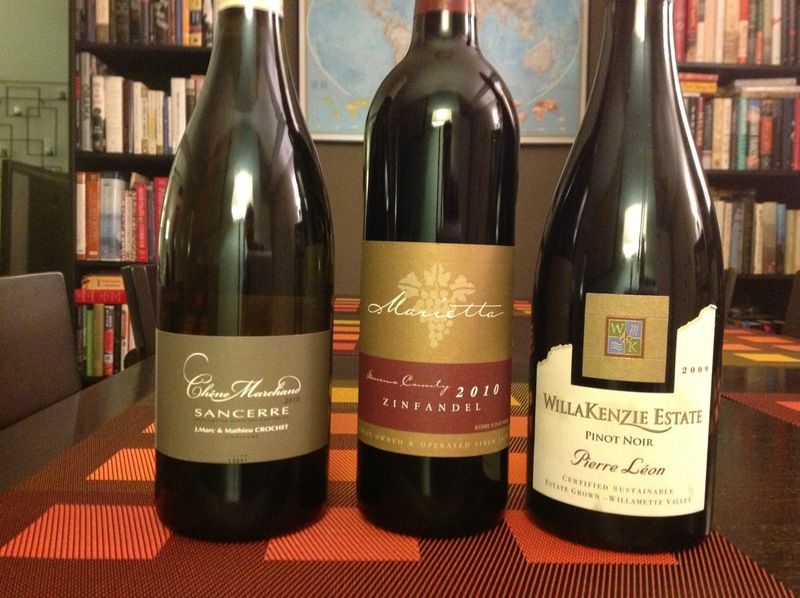 Thanksgiving Wines - This year's selections include Oregon Pinot Noir, Zinfandel and Sancerre. Thanksgiving Menu 2012 - This is what I served for dinner this year, with links to posts and recipes. I have a vegetarian friend who often comes to Thanksgiving dinner. Although I’m not vegetarian, I respect her choices and, in my quest to be a gracious host, I want her to feel she’s eating a meal as special as what my other guests are enjoying. I could just point her to the mashed potatoes and cranberry sauce, but depriving her of an equivalent to turkey, gravy and stuffing--the centerpieces of the meal--would make me feel I wasn’t doing my job as host. So I set aside a small amount of the stuffing ingredients before adding sausage and chicken stock and use vegetable stock instead. And I make a non-turkey gravy (usually caramelized onion or mushroom). 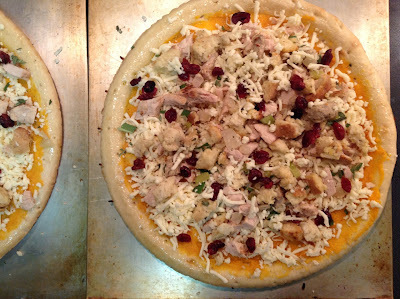 Substituting the turkey is a little trickier. 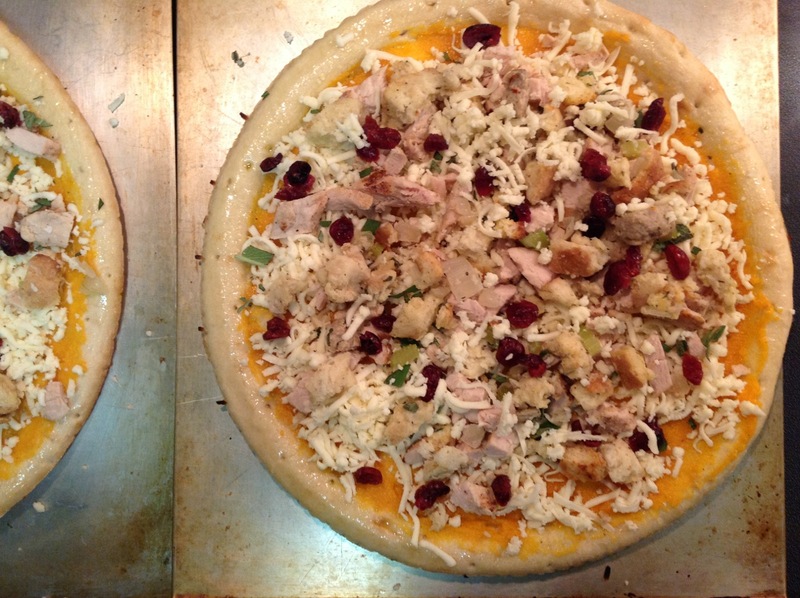 I don’t have room in the oven for a “tofurkey,” and besides, no one else would want it. A few weeks ago I tested a roasted stuffed squash, but I wasn’t pleased with the results. The dish I’ve turned to for years, which she claims to really like, is Broiled Marinated Tempeh. Tempeh is a type of fermented soy cake. The product available at Giant, Lightlife Three Grain Organic Tempeh, also has brown rice, barley and millet. It’s an 8 oz. cake, which is two servings. So in the grand Thanksgiving tradition, it’s enough for her to have a leftover serving. The recipe I use is quite flexible and encourages you to experiment with flavors. Since tempeh originated in southeast Asia, with a little thought about seasoning, you could steer this more toward India, Vietnam, Thailand, Indonesia or whatever. I make mine fairly generically Asian. 1. Combine soy sauce, vinegar, garlic, honey, sesame oil and red pepper flakes in a wide shallow dish appropriate for marinating the tempeh (I like to use a 5 X 8 sealable plastic container). Place the cakes in the marinade and turn over to coat both sides. Marinate at room temperature for 20 minutes to an hour or longer in the refrigerators (up to 2 days), turning occasionally. 3. Line a baking sheet with aluminum foil (optional, but easier to clean) and spray or brush with canola oil. Place tempeh pieces on baking sheet and bake for 12 to 15 minutes. Flip the cakes over and bake another 10 minutes. 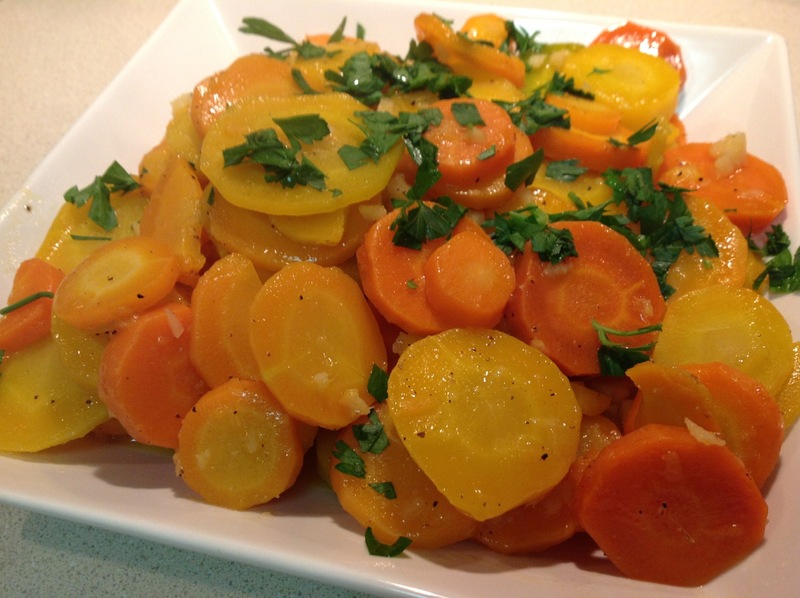 Remove from oven and serve with gravy or other flavorful sauce. For my Thanksgiving dinner appetizer, I like to shoot for something memorable and fun. Two years ago, I served "pumpkin three ways": pumpkin hummus, toasted pumpkin seeds and a pumpkin pie martini. This year, since I've had a lot fun with the Just Tomatoes freeze-dried corn (see corn cookies and corn bread), I decided to try my hand at corn crackers. I substituted half the corn meal in the recipe I found with ground freeze-dried corn. Just grind the just tomatoes corn in the food processor until it's a fine powder. I served the crackers with brie and apple butter. All three together are quite tasty. A spicy jalapeño jelly would be good with these crackers too. 2. In a medium bowl, whisk together dry ingredients through baking powder. Pour boiling water over this mixture and stir to combine. Add egg, butter and parmesan and stir until the butter has melted. 3. Spread batter in a thin even layer on a baking sheet lined with parchment or a silicone baking mat. Bake for about 25-35 minutes until firm throughout and darkening on the edges (note: I wanted mine crispy, so I baked them quite a bit longer, about 45 to 50 minutes total. If you do this, watch them carefully to prevent burning. Even then, some were still more chewy than crunchy, but they tasted good). 4. Allow to cool and then break into cracker-size pieces. Serve on a platter with apple butter and brie. 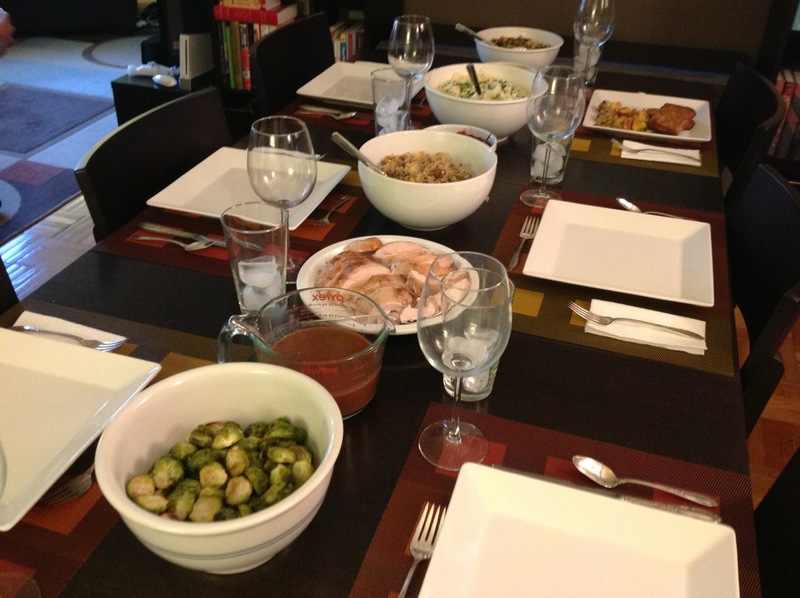 There's a lot conventional wisdom about serving wine with Thanksgiving dinner. Whether it's useful depends on what you're looking for in the wine. Is your goal to complement the food? Serve something really amazing? Or ideally both? Or do you like to break the rules and drink what you like? Years ago, I remember reading an article on wine pairing that concluded that, although there are certain combinations of wine and food that may “go” together for various reasons, really you should drink what you like. I found that quite liberating and I've applied it to my thinking of what to pair with Thanksgiving. Chris and I tend toward big reds. We drink a lot of Cabernet Sauvignon, Merlot, Syrah and Zinfandel. We experiment with blends and other interesting reds too (Petite Sirah has been another favorite lately). If we ever make it to France for a wine tour, don't look for us in Burgundy. We'll be hanging out in Bordeaux. However, big reds tend to be the tannic and, while I'm not afraid of letting a wine outshine the food, I don't want its bitterness to be overpowering. If you want a bold red for Thanksgiving, something fruity will do a better job blending in with the savory, spicy and sweet mix of main course dishes. For my bold red, I went with the Marietta Cellars Sonoma County 2010 Zinfandel ($22), which had the fruitiness and bold flavor I was looking for. I also wanted some softer choices. Lately, a lot of people have been flocking to Beaujolais Nouveau, which is a "new" wine in that it is quickly bottled and sold soon after harvest. The lack of aging means lacks of tannins and full fruit flavor. Generally it's a little too slight for my taste though, so for a softer Thanksgiving red I turn to the more traditional choice of Pinot Noir. Selecting Pinot Noir can be tricky. I find that, unlike other red varietals, low-priced Pinot is often not very good. To get good Pinot Noir you have to be prepared to open your wallet a bit wider. Because of this, it's not a wine I drink regularly, although when I find a good one it can be quite impressive. I visited the WillaKenzie winery in Yamhill, Oregon, last year and tasted their expertly crafted Pinot Noirs. The WillaKenzie Estate Willamette Valley 2009 Pierre Leon Pinot Noir ($46) is widely available in wine stores and doesn't disappoint. This pinot had a lot of flavor but didn't overpower the food. It was my favorite of these three wines. Many people default to white wine for Thanksgiving because they see that white turkey flesh and think that's what “goes.” And while I have a white wine in my trio this year, you won't find a bold oaky Chardonnay there. America's best-selling varietal just doesn't seem a good fit for Thanksgiving. It's just a bit too bold. Consulting with the wine staff at Calvert-Woodley, I ended up with the Jean-Marc Crochet - Sancerre Chêne Marchand 2010 ($25). Sancerre, a French wine from the Loire Valley, is primarily Sauvignon Blanc. 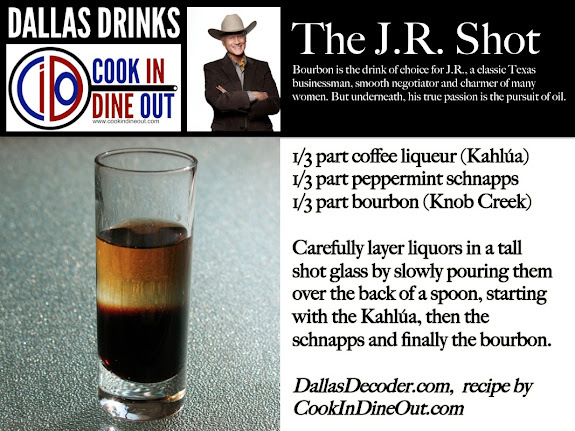 It has a nice acidity that works well with a lot of different flavors. So, in conclusion, I fully support the "drink what you like" idea, but putting a little thought into choosing something that will pair well with the variety of flavors on the Thanksgiving table will make what you drink ever the more special. 1) “Follow the leaders,” by Manuel Roig-Franzia. Every year I look forward to the Washington Post’s pre-Thanksgiving Food section. It’s always really good. Today it was exceptional. One of the year’s best. I can usually judge how interested I am in the Food section by how long it takes to read. If I have time to read a couple other sections during breakfast, it’s probably a week it won’t win Food (Section) Fight. This morning, I wasn’t even halfway through by the time I had to pack up and head to work. It was that good. This lead story about the recent history of Thanksgiving at the White House was truly great, peppered with amusing anecdotes (Mrs. Clinton threatened to fire her chef if he didn’t make white bread stuffing), interesting culinary history (the FDR-era chestnut stuffing calls for “fat” without specifying what kind—would a 1940s home cook have understood?) and some incredible-sounding recipes. I really want to make White House Sticky Toffee Pudding, and Glover Cleveland Parsnip Fritters, and Mamie Eisenhower’s Pumpkin Chiffon Pie, oh, and even Laura Bush’s Green Beans with Anchovy Butter (go Mrs. Bush for embracing anchovies, even if she wasn’t interested in the 60-year aged balsamic vinegar). 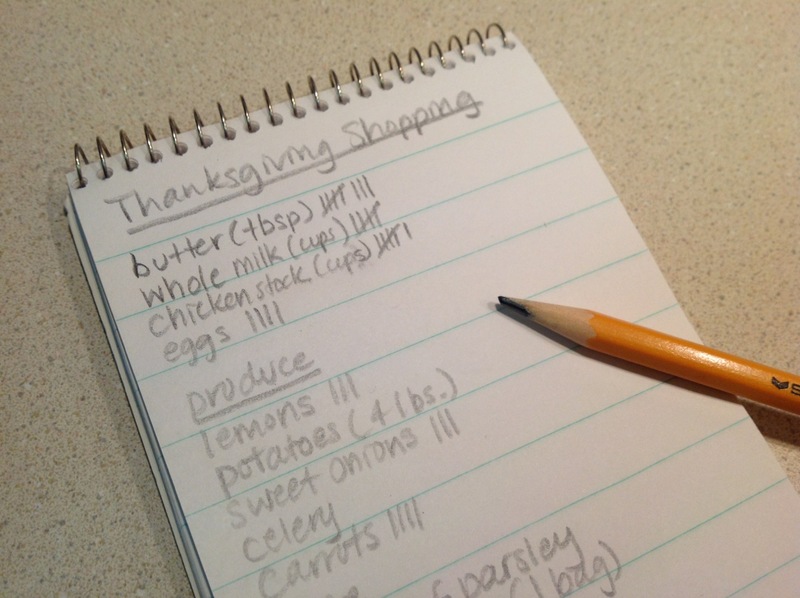 2) “For recipe handicappers, there’s Fakesgiving,” by Becky Krystal. How nice to see fellow food bloggers get a beautiful full-page spread in the Food section. Coincidentally, I discovered their blog, The Bitten Word, just yesterday (I was Googling for a kale chips recipe). And I couldn’t help but notice how much I have in common with them: They are a D.C.-based (check) gay couple (check) married in 2010 (check) that work for a publication and a nonprofit (not check now, but that was us 10 years ago). And I too invited a group of friends for a Thanksgiving dinner weeks before the actual event so that I’d have dishes to write about on my blog (actually, it was circumstantial, since my apartment is under renovation the next few weeks, but it worked to my advantage). With a lot of hard work and a little luck, maybe someday Cook In / Dine Out will achieve The Bitten Word's level of success (I can dream). Some great recipes accompany the story, such as their Fried Brussels Sprouts with Paprika-Spiked Dipping Sauce. 3) “For a White House menu, red or rosé works, too,” Wine by Dave McIntyre. I’ve been reading a lot of Thanksgiving wine stories lately, and will even have my own tomorrow. McIntyre offers up about the best advice I’ve read as to why certain wines work best for pairing with the meal. I love what he says about bold wines: “Cabernet and steak could win the food-wine equivalent of ‘Dancing With the Stars,’ but Thanksgiving is more like a communal square dance.” That’s perfect. 4) “The science behind 5 holiday food flubs,” by Robert L. Wolke. Wolke is the author of What Einstein Told His Cook, which I read and enjoyed earlier this year. When I saw another science-minded cook, America’s Test Kitchen’s Christopher Kimball at a National Museum of American History event recently, I thought about asking him what the biggest issues are that a little food science could help home cooks address at Thanksgiving. Wolke covers some very topical issues, including how to master gravy, why just the right about of sugar is important to making cranberry sauce and why it’s okay to roast a turkey that’s still frozen. Useful stuff. 5) “Pork Paillards in Parmesan Crust,” Dinner in Minutes by Bonnie S. Benwick. Leave it to Bonnie to oversee an amazing Thanksgiving section and still have time to whip up an appetizing Dinner in Minutes recipe. This sounds really good. Definitely something I can see myself making on a weeknight. 1) “Try a steam-powered turkey,” by Jeff Gordinier. While the Post dived into tradition with presidential Thanksgivings, the Times went experimental with this lead story on Jacques Pépin’s technique for steaming, yes steaming his turkey before roasting it. The story addresses the likely skepticism of its readers, and count me among them. Will the turkey’s skin still get nice and brown if it’s been steamed? Apparently so, but my eyebrows remain raised. If you’ve roasted, brined, grilled and deep-fried your turkey, maybe this new method is for you (or, as I suggested in today’s Washington Post Free Range chat, why not sous vide it?). 2) “Side dishes with a sense of daring,” by Julia Moskin and Melissa Clark. While I may be skeptical about steamed turkey, I have not qualms about the delicious dishes explored by two of my favorite Dining section writers. Beehive Brussels Sprouts with Spicy Vinaigrette, Cauliflower with Oyster Mushrooms and Sherry and the beautifully composed Heirloom Squash Salad with Pepita Purée and Pickled Shallots, all sound like amazing original dishes for Thanksgiving. 3) “Take a Pumpkin Pie, Add One Englishman,” by Florence Fabricant. Le Bernardin’s Deconstructed Pumpkin Pie isn’t necessarily something I’d make, but I enjoyed reading about it. The dish converts the pumpkin from the traditional custard into a cake and mousse, along with a pumpkin and cranberry confit. 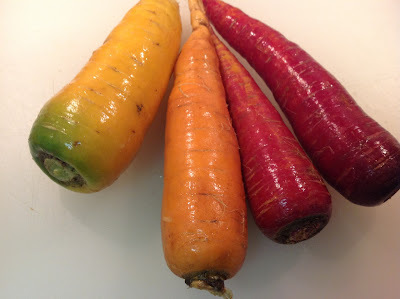 4) “Roasted, Smashed, Dolloped, Devoured,” How to Make Everything by Mark Bittman. Bittman turned to his friend Jean-Georges Vongerichten (now that’s name-dropping) for advice on making ABC Kitchen’s Squash on Toast. The roasted squash served with mint and ricotta atop toast sounds like a perfect Thanksgiving appetizer. I might have to try this. 5) "As Not Seen on TV,” Restaurants by Pete Wells. Ever wonder what a restaurant review with a “poor” rating would read like? Here’s your chance to find out, as Wells eviscerates Guy Fieri’s Times Square Guy’s American Kitchen and Bar. It does sound really awful (“…is there a long refrigerated tunnel that servers have to pass through to make sure that the French Fries already limp and oil-sogged, are also served cold?”). I don’t quite understand why the whole thing is written as questions; perhaps that’s a nod to how Fieri speaks? (I don’t watch his show). The Washington Post. On this ever-important week for home cooks, the Post knocks it out of the ballpark, giving us coverage that’s insightful, expansive and just downright delicious. 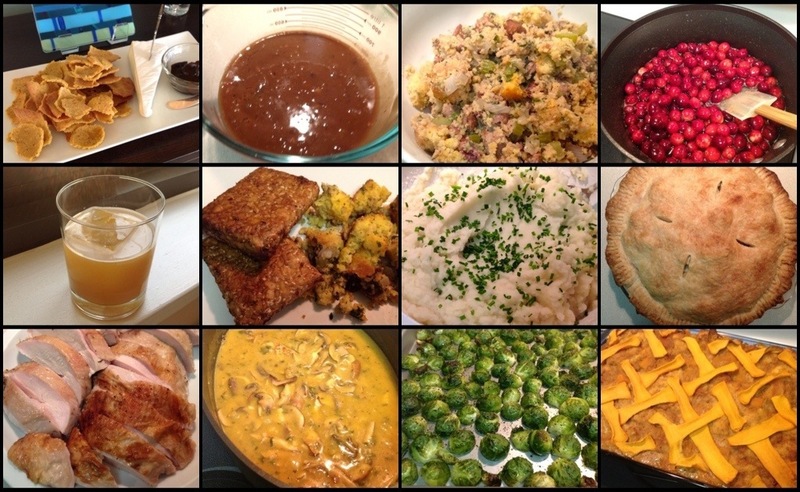 Despite having hosted my own “Fakesgiving” last weekend, I’m sort of itching to do it again now.